XJIsolator provides galvanic isolation between a Device Under Test (DUT) and a JTAG controller. 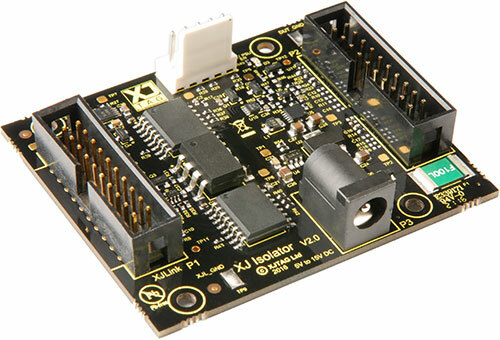 Its small form factor means an XJIsolator board can be easily mounted inside a test fixture. Galvanic isolation overcomes the challenge of connecting a test system to a DUT in situations where (either intentionally or unintentionally) they do not have a common ground. XJIsolator provides galvanic isolation for the Test Access Port (TAP) signals that are used when testing a DUT with JTAG. XJIsolator easily integrates into a test set-up via its two 20-way IDC connectors using standard ribbon cables. It supports all of the TAP signals required for JTAG testing, passing them to and from the DUT. The XJTAG’s JTAG controllers have an advanced auto-skew algorithm which automatically compensates for the small additional delay introduced by adding the XJIsolator to a test set-up, making it simple to use and ‘invisible’ to XJTAG’s software. The DUT side of XJIsolator runs at logic levels of 1.8 V to 3.3 V, set by reference voltage on the JTAG controller or optionally on the DUT. To isolate the DUT signals from the JTAG controller an external power supply (not supplied) is required, supplying 5-15 V DC. XJIsolator has been designed to work with XJTAG’s existing hardware and software products, including the XJLink2 and original XJLink JTAG controllers, and the complementary XJExtender and XJXDP boards. Combining these boards can address signal integrity issues and/or high drive strength requirements as well as galvanic isolation. Order code: XJTAG-ISO-0010. Please contact your local distributor for a quote.